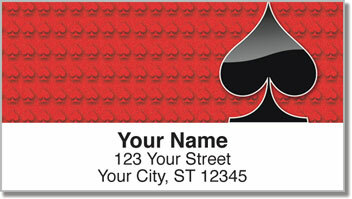 Get the classically cool look of a Las Vegas casino and stick it on all your outgoing mail! 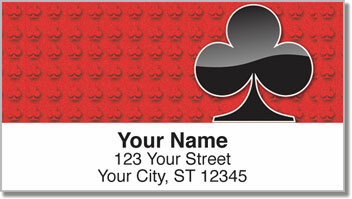 Each of the four return address label designs in this set feature one of the four suits found in a deck of playing cards. It's the perfect pick for all kinds of card sharks, whether you're a poker player, a blackjack black belt or even an expert at Crazy Eights! 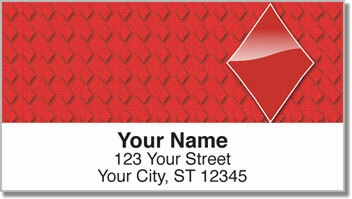 Card Suit Address Labels are a lot of fun! And you can only find this selection online at CheckAdvantage! Find out how much easier it is to prepare your outgoing mail when you no longer have to worry about writing your name and address on every envelope every time! Just peel, stick and send your letter and packages on their way! 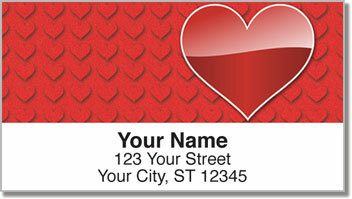 Make Card Suit Address Labels your own today! They are also available as matching personal checks.